Please can Nick Clegg insist on closing public libraries? I saw this headline on Twitter today. Well, given how successful his initiatives have been so far, it just might be worth a go. Attempts at humour aside, the destruction in the Liberal Democrat vote will not have much impact on public library closures. They controlled far too few councils for that. In the few they did control, their record was not superb. Two come to mind. In Newcastle, they are not exactly closing eight while Hull are closing two libraries and encouraging voluntary redundancies for qualified staff. In both, Labour will now take over. What will have an impact on saving libraries is local people making their voice heard on the matter, as has been so well shown this week in North Yorkshire and Suffolk. All hail to the public library – On the Commons (USA). Fort Worth library has removed “public” from it’s logo to “move with the times” – article examines retreat from the state in US libraries via Walk You Home. Future of library services in the Big Society – Neil Stewart Associates (Conference). Keynote address to be made by Ed Vaizey. My library, my friend – Guardian. The children’s section of Anna-Marie Julyan’s local library was important to her and she wants to know other reader’s experiences. On the campaign trail … – Thoughts of a wannabe librarian. 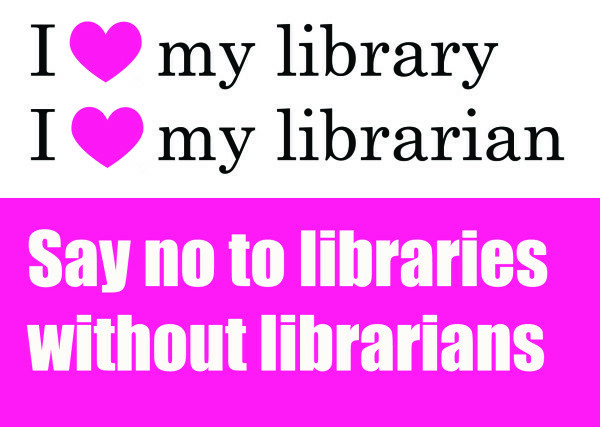 Voices for the Library campaigner explains why he does it. “Although the prospect of a “charity, social enterprise or mutual” running and operating your local library or health centre may not be as objectionable as a profit-hungry public limited company, it’s privatisation all the same. And behind it is the same old neoliberal dogma which says that state or local authority provision of public services is inherently undesirable and needs to be ended.” Privatised Britain is not a fait accompli – Guardian. “Triumph” for North Yorkshire library campaign, but more protest in Lewisham – BookSeller. World’s best libraries – Beyond the margins. “I have a theory about libraries. I think they make people happy and thoughtful. Kind. Appreciative. You’re in the presence of so much, given free.” Favourite libraries listed, none of them are – shamefully for the UK – in this country. Gloucestershire – £20,000 to Hester’s Way Community Partnership for four years plus old library building in order to pay for a community-run library at Oasis Youth Centre. Birmingham – Andre proves popular when it comes to personality plaudits – Walsall Online. The “face” of Birmingham Library wins Mr Personality award. Camden – Library campaigners invoke spirit of Bill Budd – Camden New Journal. Facebook campaign invokes spirit of deceased pro-library councillor ” “Bill Budd was the brave Labour councillor who defied the whip back in 1998 to vote against Library closures. It was his vote that saved the day and the first time in 35 years he voted against the party. Camden library lovers salute Bill.” Ham & High also reports the news. Gloucestershire – Libraries are not essential – This is Gloucestershire. Libraries are not essential as everyone can buy books/internet these days. The implication being everyone that matters. See comments. Gloucestershire – Residents give views on future of library and youth services in Hester’s Way – This is Gloucestershire. In a complicated deal, the library is to be given to a charity to rent out to a housing association in the hope that that will pay for another building to be a library in the day and a youth centre at night. Library is in “a deprived area without a parish council” so £20,000 grant for four years also given. Leeds – Future of Leeds libraries set to be decided – Guardian. Decision on future of 20 libraries to be made on 18th May. Lewisham – Protesters take fight to the top to stop closure of five libraries – London Evening Standard. Demonstration by Lewisham and Brent campaigners outside DCMS offices. North Yorkshire – U-turn over North Yorkshire libraries – Gazetter & Herald. “Public outcry” caused change to closures plan. Peterborough – Union fears over volunteers – Peterborough Today. Trusts ask for library volunteers. Suffolk – Suffolk’s council’s Andrea Hill on leave for inquiry – BBC. Controversial chief exec ordered on to extended leave while whistle-blowing complaints investigated. Surrey – Calls for Surrey to “tear up” library closure study – Surrey Herald. Byfleet Library’s official usage did not take into account closure for refurbishment, library has several doors but only front door counted. Formal complaint to Information Commissioner due to failure to answer request. Print article This entry was posted by Ian Anstice on May 6, 2011 at 9:43 pm, and is filed under Uncategorized. Follow any responses to this post through RSS 2.0. You can skip to the end and leave a response. Pinging is currently not allowed.